Cloud computing is a general term for anything that involves delivering hosted services over the Internet. These services are broadly divided into three categories: Infrastructure-as-a-Service (IaaS), Platform-as-a-Service (PaaS)and Software-as-a-Service (SaaS). Essentially, cloud computing is Internet-based computing. AVS can host your applications or servers in a secure data center that is SAS70 Type II Certified, allowing you to access your data and desktop functions – anytime and from anywhere in the world over the Internet securely. Cloud computing can also let you access your desktop from anywhere you have Internet access, allowing you and your employees to perform work functions exactly as you could from the office. This technology allows you to eliminate thousands of dollars in computer expenses, and spend significantly less on cheaper hardware, such as thin clients or dummy terminals. 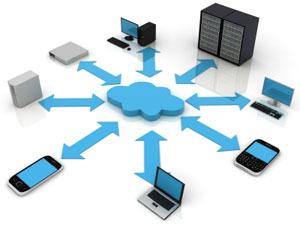 AVS has proven expertise in designing cloud computing solutions. Talk to one of our specialists today and see if cloud computing is the right solution for your business. One of the many technologies AVS uses to securely deliver applications, data, and files to the end-user via the web. This technology could be hosted in a data center but give the user the same experience and capabilities as though their systems were in the office.